Russel C. Wells was born on July 4, 1934 in Detroit Michigan. He graduated from Detroit Cooley High School in 1952. He graduated from the University of Michigan where he received his Bachelor of Science Degree in Electrical Engineering in 1957 and from the Detroit College of Law receiving his LLB degree in 1964 and his Juris Doctor in 1968. He was the Northern Regional Patent Counsel for The Bendix Corporation. He married Joan Marie Podany on June 22, 1957. They were blessed with two sons and a daughter. 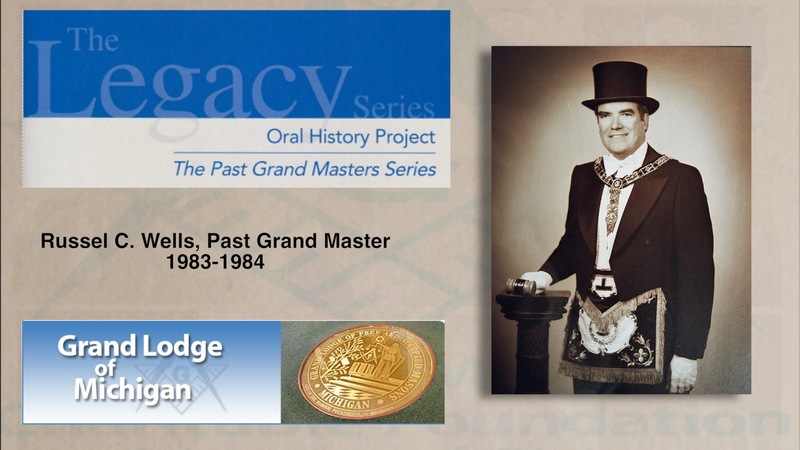 He was raised as a Master Mason on October 18, 1956 by Glenn L. Alt, Grand Marshal and Rex P. Sackett, Junior Grand Warden in William M. Perrett Lodge No 524. In 1975, the Senior Wardens of Metropolitan Detroit elected Russel as their presiding officer. He served his Lodge as Worshipful Master in 1976 and that year he was elected president of the Masonic Masters’ Association of Metropolitan Detroit. In 1958 he joined and is a Life Member of the Ancient & Accepted Scottish Rite, Valley of Detroit where he was active in the portrayal of the dramatic degrees. Also in 1958 he joined Moslem Temple A.A.O.N.M.S. where he served as DeMolay Chairman from 197l-77, Masonic Relations Chairman in 1977 and on the Legal Staff from 1977-80. The Detroit Court of the Royal Order of Jesters nominated him to membership in 1972. In York Rite Masonry, he is a member of Birmingham Chapter No. 93 R.A.M., Monroe Council No. 1 R. & S.M., Detroit Commandery No. 1 K.T., York Rite College No. 1, and in 1982 he was elected to receive the Order of the Purple Cross of the York Rite Sovereign College of North America. He is a member in Victoria Chapter No. 290 O.E.S. in Detroit and Southfield Hi-12 Club. The following lodges have elected him as an Honorary Member: Centerline No. 550 in 1978, Lincoln Park No. 539 and Dearborn No. 172 in 1980, Golden Ark No. 595, Vienna No. 205, and Olive Branch No. 542 in 1982, He is also an Honorary Member of Mizpah Shrine Temple of Fort Wayne, Indiana. He served on the Administrative Board and the Finance Committee of the Nardin Park United Methodist Church, and on the Deerfield Village Community Association where he was the Charter Treasurer and the second President. He served on the Community Advisory Board of Woodland Hills Center in Troy. He became Michigan’s Most Worshipful Grand Master of Masons during the closing hours of the 158th Annual Communication of the Grand Lodge of Free and Accepted Masons of Michigan in Flint on May 25, 1983. During his term of office he laid the Cornerstone for the Masons Wing at the Michigan Masonic Home on August 27, 1983.